WOW just got the press release for Illamasqua’s new SS11 collection called Toxic Nature and it looks incredible. I love the photos! Toxic Nature comes out March 10th online and March 17th at UK counters, but 3 lucky people will win their favorite products from this collection if they add them to their waiting list on their site. They will pick the winners on March 9th. Illamasqua are proud to present the second collaboration with visionary manicurist, Mike Pocock. A beautifully presented set of two false thumb nails, these have been designed and individually hand made by Mike. ‘The mutated aesthetic of the nail was inspired by the corrupted hues present in the Toxic Nature collection’. agreed. the photos are a turn-off. can’t wait for the polishes! Hahaha, same! Creepy – there’s something eerie about those photos. But that’s probably what they were going for. I absolutely LOVE their promo pics. They are always so artistic! I’m not so huge on makeup, but I do think the collection is gorgeous. Maybe I’ll pick up bacterium or radium. Illamasqua’s promotional photos (of models) are always neat, but they are obviously so heavily photoshopped that it’s near impossible to tell what is actual makeup artistry and what was enhanced and added on the computer. Especially that last one – her face is so digitally enhanced and airbrushed it looks like a digital painting. It seems to contradictory to create beautiful makeup art and then alter the photos of it so much no one can tell what was actually done in real life. I agree… and must add, she looks utterly CREEPY! That aside, I love the cream pigments look lovely. Too bad the peach is only available to the EU. I find the photos and makeup fascinating. Love the polishes. I agree. I love when Illamasqua does unusual stuff- it stretches my brain and makes me think about makeup in new ways- always good! And it certainly grabs your attention- super cool. 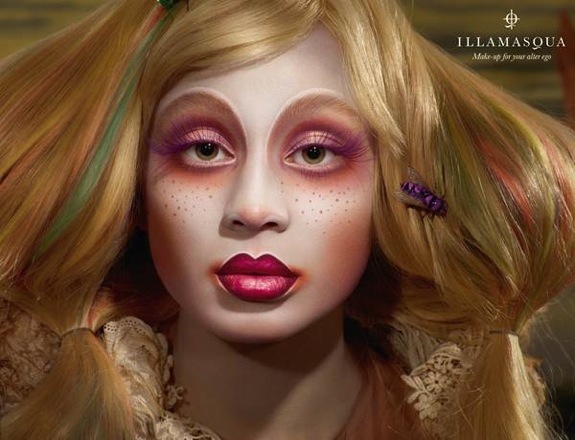 I LOVE Illamasqua – especially because sometimes their promo photos stray away from the “normal” beauty ideal all the other make-up brands want to sell. It’s different and therefore it stands out. I’m not a photographer, so I can’t judge inhowfar these photos are photoshopped and to what extend. If you watch a video of Alex Box working live on a model, it is pretty amazing what she can do with make-up and the end product does always look as though it’s out of a computer programme. Really intrigued by the cream pigments. Love the fact they’re matt and hope they’re really crease resistent. Will def get a few of the polishes. I LOVE their polishes – have loads already and they never disappoint. I must give Illamasqua kudos for originality..the first and last photos above are a little scary. However, I’m interested in the collection, can’t wait to see swatches. The polishes look awesome. I love the photos! I think they are perfect for a collection named Toxic Nature. It all looks great but I’m mostly excited for the polishes (of course) especially Bacterium. The bottle shot and description are interesting so I can’t wait to see a swatch of it. Where in the US is a good place to buy the polishes, if any? I was just reading another blog awhile ago that commented on companies using the same models and the same pics for their promos. This is surely not the case for Illamasqua!!! What a colorful looking collection. I still do not own any Illamasqua polishes, but hopefully that is about to change. I, too, accessorize my forehead with a spider. The point about artificiality is a good one. Their colours are wonderful. The images are striking and far more interesting than the banal fare put out there by the average cosmetic company. I love Illamasqua. The lipstick doesn’t budge and the polishes are lush. Bacterium is going to be VIRAL! WOW! I am so impressed by the makeup application. These guys are masters at using shadows and highlights to sculpt the face. Yes, the makeup is slightly uncomfortable to look at (it kind of has a dilapidated doll from a horror movie movie vibe going on) but it’s technically brilliant. I so appreciate them churning out new thought provoking visuals each campaign. They really are all about nurturing creativity. I LOVE Illamasqua and so wish they were available in Canada. i am a MUA for Illamasqua in australia…. and i just have to clear up with you all on how heavily UNTOUCHED our promo images are. the closer you look the easier you can see its untouched. for those who are unaware… illamasquas products photograph beautifuly on the skin unlike anything else and alex box is probably the greatest makeup artist of all time.